STAR TRACE's liquid line separators are designed to extract the ferrous materials from the slurry or liquid raw materials in order to purify the material in the production process. Strong tubes filter the flow and extract the unwanted ferrous metal. The unit is simply connected to the existing pipeline via flanged or threaded ends. Simple and easy access is possible using the quick release lid. STAR TRACE's Liquid Line separators (or) Prong Magnets are designed to extract the ferrous materials from the slurry or liquid raw materials in order to purify the material in the production process. Strong tubes filter the flow and extract the unwanted ferrous metal. 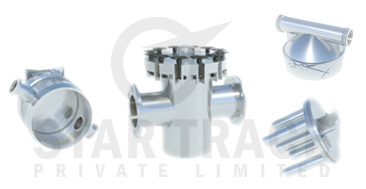 The unit is simply connected to the existing pipeline via flanged or threaded ends. Simple and easy access is possible using the quick release lid. Cleaning of the magnets is easily accomplished by removing the cover plate of the housing and sliding out each magnet assembly. It is equipped with high-energy Rare-earth Magnets. Liquid Line Separators are engineered to remove ferrous contaminants from liquid and slurry lines. Efficiently remove tramp iron before maintenance and product contamination problems occur. The benefits of this liquid line separators can be experienced in most cases with no appreciable pressure drop or reduction in flow rates. All units incorporate a sump type housing to trap non-ferrous particles. Liquid Line Separators may be installed horizontally, vertically, or on an angle without affecting their magnetic efficiency. The benefits of this liquid line separators can be experienced in most cases with no appreciable pressure drop or reduction in flow rates.